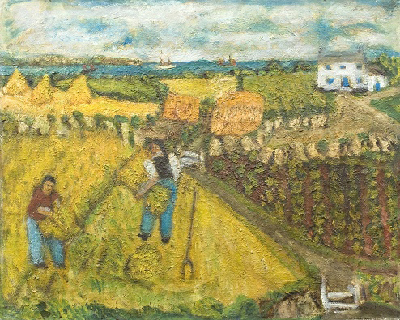 The painting is Harvesting by Cornish artist Mary Jewels whom we studied back in January this year. In this earlier blog I mentioned that Mary Jewels had been called the 'English Van Gogh' arising from her painting "Cornfields with peasants" which at the time I couldn't locate. The painting which brought about this tag is in fact Harvesting as seen above. My Disqus contact also owns an original Mary Jewels painting of Mousehole Harbour amongst his/her collection of self taught artists. Hopefully I'll receive an image of the painting in the mail so that I can share it with you. It's days like this I'm so pleased not to be a luddite! No protest from me!! Other news from the mailbox today is that I must welcome aboard two new subscribers- R of Dandenong and Ch of Mount Waverley. I do hope you enjoy the blog. Tomorrow I'm intending to look at some artists who are or were protesters.